Christmas is a time steeped in tradition. Yet how Americans have celebrated the holiday has changed dramatically over the centuries, as diverse communities have brought their customs and cultures to bear on the celebration. Catholics, in particular, have helped to make Christmas more vibrant through their collective contributions to the season’s festivities. A look back in time reveals how our local celebrations have been enriched by the diversity of people who have made this city home. Things were even worse in much of New England, where the holiday was outlawed by Puritans who regarded Christmas celebrations as pagan ritual or Popish pageantry. As the city’s Catholic population grew, they began to reshape the holiday and enrich the cultural celebration. German immigrants, many Catholics among them, were the ones who first brought the custom of decorating Christmas trees to North America. German immigrants also brought with them a rich musical tradition, both instrumental and choral, whose effects are seen in the pages of church hymnals to this day. They and other immigrant groups have gifted us over the years with songs and carols that have now become a standard part of our shared holiday customs. During the late 19th and early 20th centuries, as new Catholic immigrant groups established themselves in the United States, the ways in which we marked the holiday continued to expand. The Catholic Standard and Times took pride in reporting on the various traditions and festivities taking place within the parishes, often with a bit of curious fascination. It commented on the elaborate Nativity scenes erected in Italian and Polish parishes, and informed readers of the various ethnic customs celebrated throughout the Philadelphia Archdiocese. Among Catholics, Christmas was a time when communities could celebrate their ethnic heritage and fill parishes and parish halls with the sights, sounds and flavors of their homelands. At a time when U.S. church leaders sought to downplay divisions within the Catholic community and enforce a more unified — or “Romanized” — vision of Catholic faith and practice, Christmas became a time of year when a rich tapestry of customs could flourish. In fact, one could argue, that it was during the Christmas season when parish communities could be their most authentic selves. By the middle decades of the 20th century, Christmas celebrations grew more Americanized as Catholics moved out of ethnic enclaves and entered more fully into mainstream society. Newly developed suburban parishes, less tied to any one ethnicity, put on shows and pageants that were more or less indistinguishable from one another. It was also a time when federal immigration restrictions prevented an influx of new cultures and communities. In recent years, our local Christmas celebrations are again revealing the changing face of the Catholic community. Today’s growing immigrant communities have added their own touches to the season, from Hispanic posadas that reenact the journey of Mary and Joseph, to Simbang Gabi celebrations among the Filipino community. Catholics of Southeast Asian, Caribbean, and African descent likewise mark the holiday with their own special devotions and family customs. The spirit of Christmases past reminds us of the gifts of cultural diversity within the church and the richness that it provides. As recent news headlines remind us of the importance of always welcoming the stranger and migrant, may we also welcome the gifts that newcomers bring to our collective holiday celebration. May we always make room in our parishes for the rich customs and traditions of all those who come together to celebrate Christ’s birth. Thomas Rzeznik is associate professor of history at Seton Hall University and a member of the board of managers of the American Catholic Historical Society (www.amchs.org), located at 263 South 4th Street, Philadelphia. 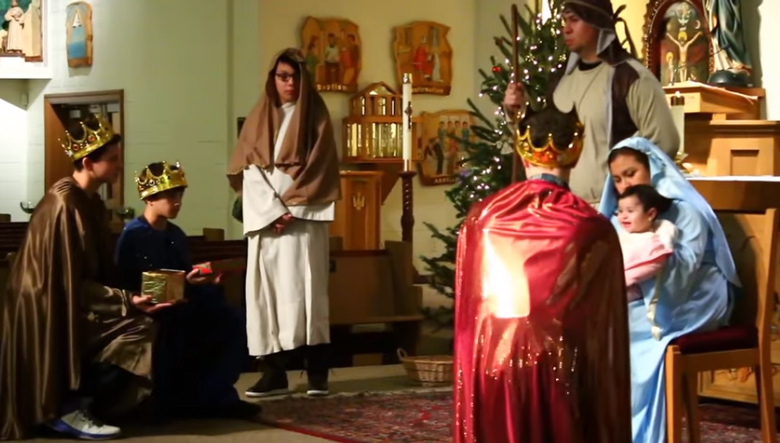 Watch a video below of a local living Nativity and multicultural posadas celebration at St. William Parish, Philadelphia.